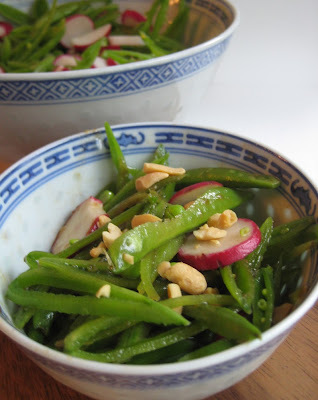 I love sugar snap peas, especially raw. I've been known to buy a bag of them to snack on during the long train ride to New York - they take care of both the urges for crunchy things and sweet things, and are full of folate, Vitamin C, and fiber. Win-win! I tossed a bag of sugar snap peas into the grocery cart one week with no plans for them. Eventually, I opened it up and started snacking. Before I got too far, however, I thought I should share their goodness with my loving husband. After checking the Internet, I found a number of snap pea salad recipes that involved radishes. That made sense to me, because both vegetables have that horseradish-y bite (it's very subtle in the peas, but it's there). I didn't like any of the dressing ideas, and most of them had cheese of some sort, which did not photograph well at all. Then I found one that was Asian-y, with soy and sesame oil. It used fruit preserves too, which I thought was overkill. The peas are sweet already! Instead, I put in the tiniest bit of peanut butter, which helped emulsify the dressing. The end result was delicious, and we polished off all of it in one sitting. Put the peanut butter in a small bowl with the soy sauce. Beat with a fork until incorporated. Add the vinegar, ginger, sugar, sriracha, and oils and beat until emulsified. Season with salt and pepper. The dressing should be boldly flavored, as the vegetables will water it down. 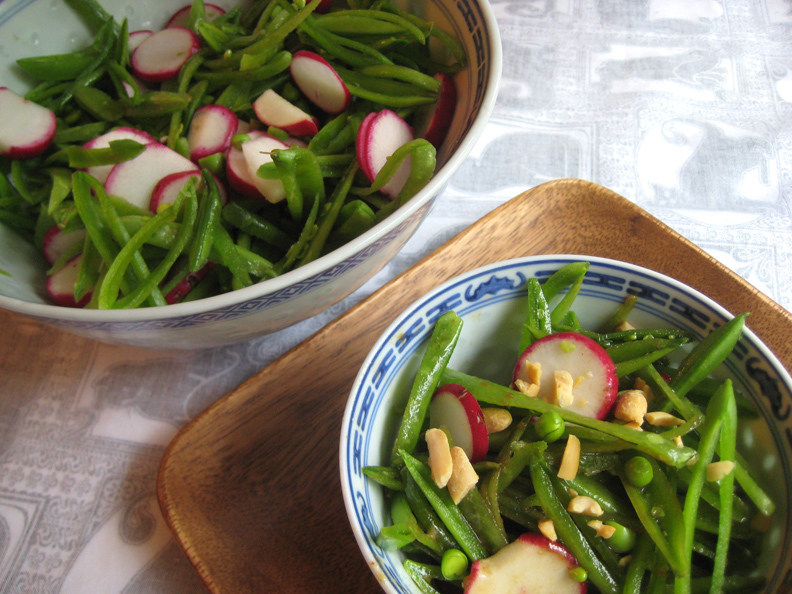 Julienne the sugar snaps and slice the radishes. Place in a large bowl and toss with the vinaigrette. Just before serving, stir in the peanuts. Taste for seasoning and add more salt, if necessary.